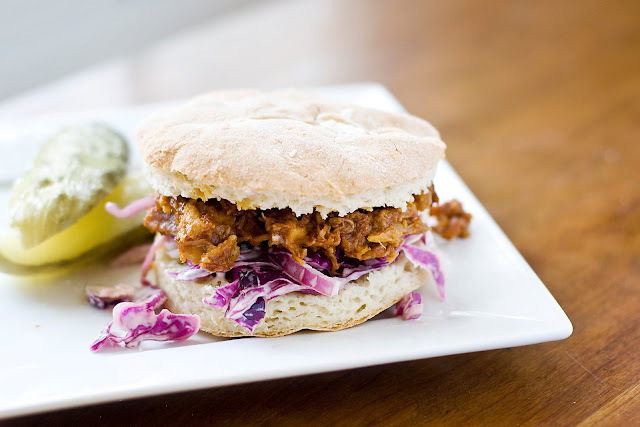 What is not to love about BBQ pork sandwiches? I always find room in our summer schedule to make this at least once. First, it is a great way to use up my extra BBQ sauce that I had made for something else like BBQ chicken legs or ribs. Secondly, it feeds a crowd. Our summers are busy and we find ourselves with friends and family over on the weekends. The last thing I want to do is spend my time in the kitchen when I have my family in town. I would rather be shopping, talking, laughing and playing games. I add the pork and the BBQ sauce to the crockpot, set the temperature and I am set for the day or a few hours. Easy, simple and always a crowd pleaser. Along with making the pork and coleslaw, I made some gluten free flat bread for those of us that are trying to stay wheat free. I used a cookie cutter to cut them into the shape of a bun. The bread held up remarkably well despite the juices from both the coleslaw and pulled pork. I was impressed. Wether you use gluten free bread or regular buns, coleslaw or no slaw, eat one or two, serve for dinner or lunch…this meal is easy, simple and always makes great left overs. NOTE: I use two cups for BBQ chicken legs or ribs and save 1 cup aside to make this recipe a few weeks down the road. In a crockpot, add your 1 cup of sauce and pork roast. Set temperature to high and let cook for 3-4 hours. If you wish to cook this on low you can, it will take 8-10 hours. When the meat is done, meat will PULL apart easily. Continue to pull pork apart into bite size pieces and mix into the sauce so that every piece is covered. Serve pork immediately or refrigerate for later use. 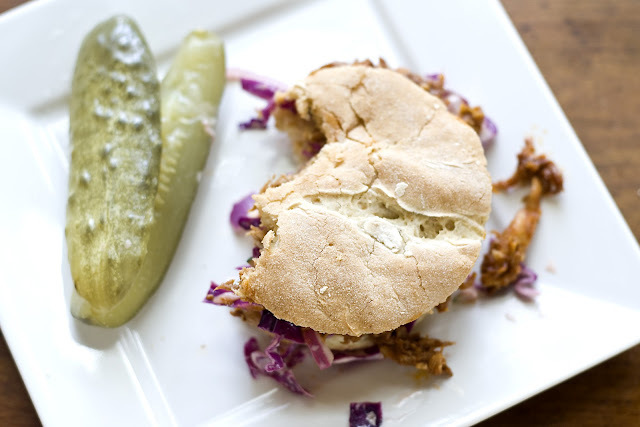 We add coleslaw to our sandwiches and the recipe can be found here. Looks like a perfect tailgating recipe to me Sherron. 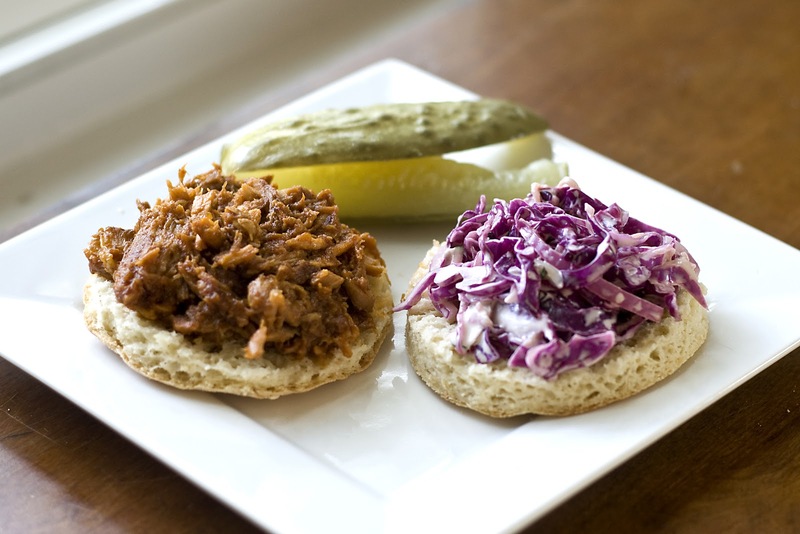 Love pulled pork! Yum!! Happy Friday! Thank you Heather! I hope your weekend was a good one too. I saw this on your email update and I've been thinking about it since then. I cannot try your homemade BBQ sauce. It really looks delicious. I cannot think anything else when I think about biting to this sandwich... It looks really good Sherron!!! Let me know how it turns out when you try it. Thank you for the comment.